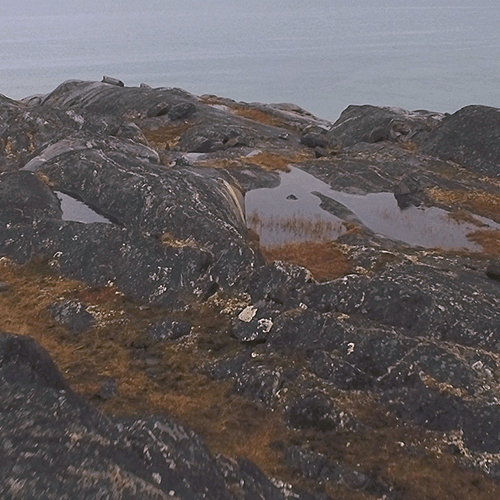 Aerial images show a landscape of mountains, shores and sea that characterises the surroundings of Qajartalik in Nunavik. On and off, the sound of the wind and the cries of seagulls are heard in the background. 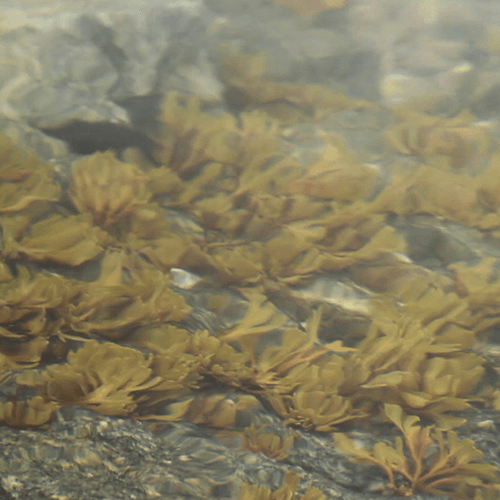 Then the camera focuses on Arctic vegetation and seaweed. 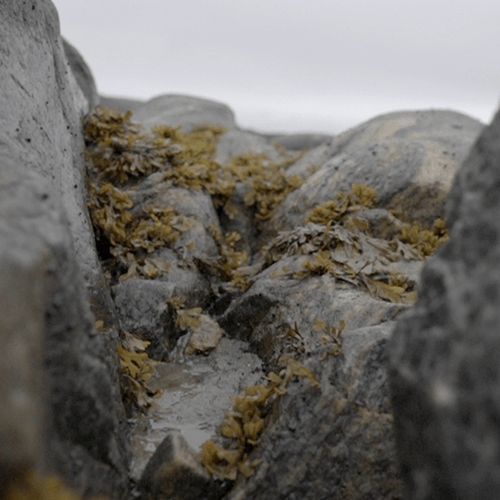 Toward the end of the video, the shots zoom in on the island and the enigmatic faces carved in stone. 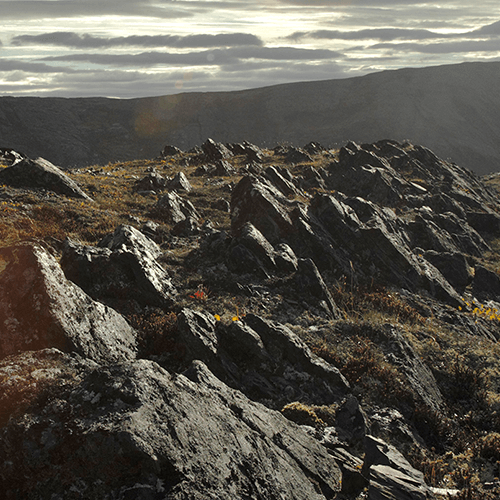 Qajartalik is a rock art site located on the Ungava Peninsula in the Nunavik region (Northern Quebec). The site features more than 180 carvings of human-like faces, some of which are endowed with animal attributes. These petroglyphs are found mainly on two large outcrops of steatite commonly called "soapstone." 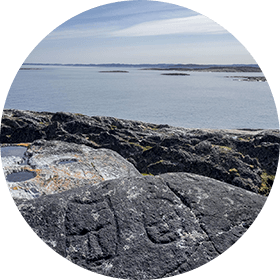 The images at this ancient place were carved by the Dorset people who inhabited the Arctic before the Thule-Inuit. 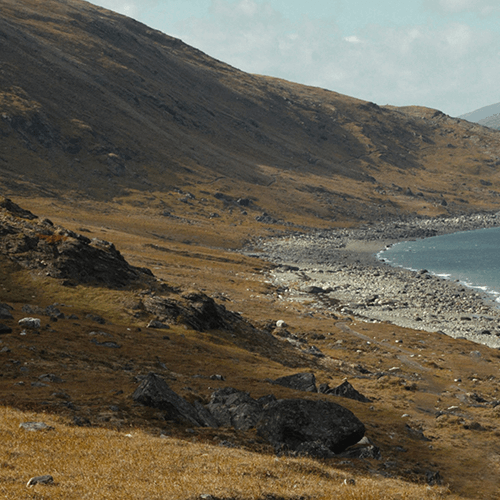 However, after its discovery, Qajartalik became of great cultural interest to the Inuit of the Kangiqsujuaq village who now consider themselves the caretakers of this place. 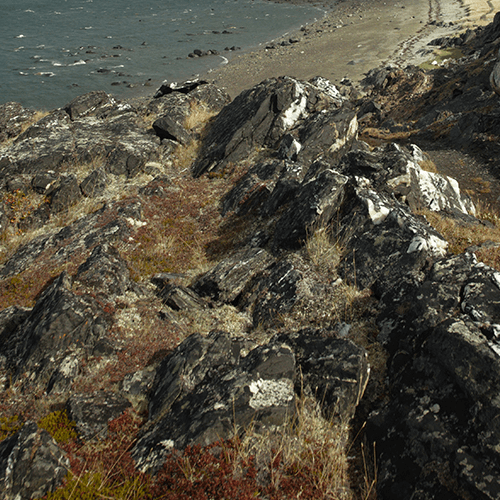 The Qajartalik site is situated in the Hudson Strait on Qikertaaluk Island, off Whitley Bay. The petroglyphs are located in a long granitic depression interspersed with veins of steatite that forms a basin stretching over 130 metres. 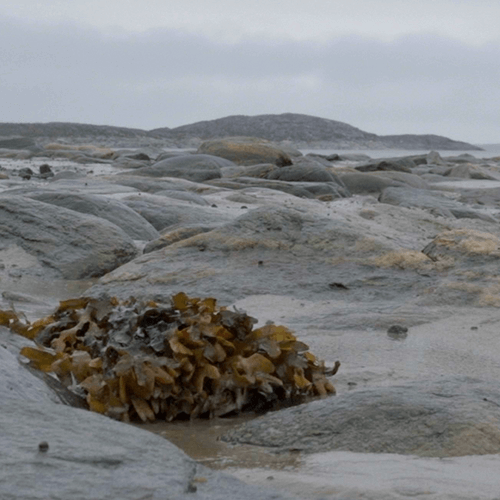 The landscape of herbaceous tundra in northern Nunavik unfolds into vast expanses of moss, lichen, grass and flowering plants. Rocky outcrops are interspersed with countless lakes and rivers that meander through vast plains and valleys and down mountains. Although this region is often seen as a lunar desert under a constant blanket of snow, it is far from reality! 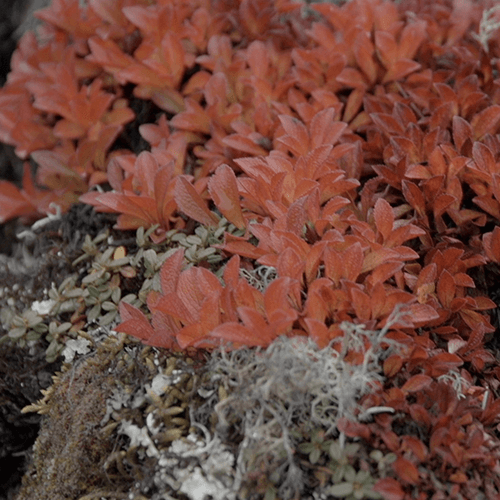 Despite a lack of trees, the flora is abundant with lichens, mosses, small creeping shrubs and Arctic flowers. During the summer season, vegetation transforms the landscape into a lush carpet of kaleidoscopic colours not unlike the spectacular aurora borealis of the long Arctic nights. Although the vegetation is very hardy, the species are in a smaller diversity than in southern Canada. They include Arctic poppy, Arctic willow, Arctic white heather and small fruits such as cloudberry or blueberry. Polar bear, walrus, seal, caribou, snowy owl and Arctic char are iconic animals of the Arctic wildlife. Long, very cold and dry winters are typical of the polar climate in this Low Arctic region. Precipitation of about 200 mm per year occurs mostly in the form of snow, particularly during blizzards. The long winters, with an average temperature of -25ºC, give way to short summers, during which the average temperature stays at around 9ºC. 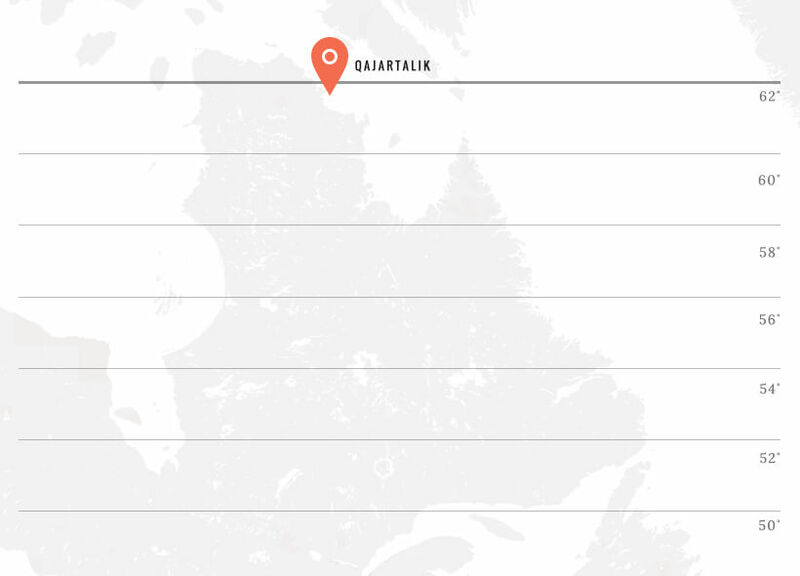 Qajartalik is a term in the Inuktitut language that means "the place where there is a kayak." Although this watercraft is not depicted on the rocks, the oval and hollow geological formation where the site is located may have inspired the name of this place. Qajartalik is an old quarry where various peoples went to find steatite which they used to make everyday objects, such as oil lamps and cooking pots. The site was also used for the creation of images carved in stone called "petroglyphs." The Dorset culture (550 Before Common Era - 950 Common Era) was widespread in the Canadian Arctic. 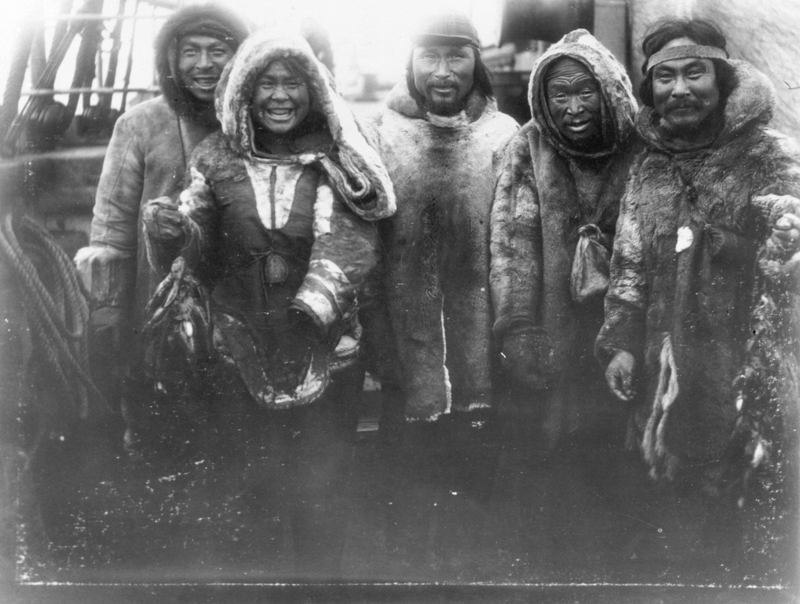 These nomadic hunter-fisher-gatherers subsisted mainly on marine mammals, namely seal and walrus. 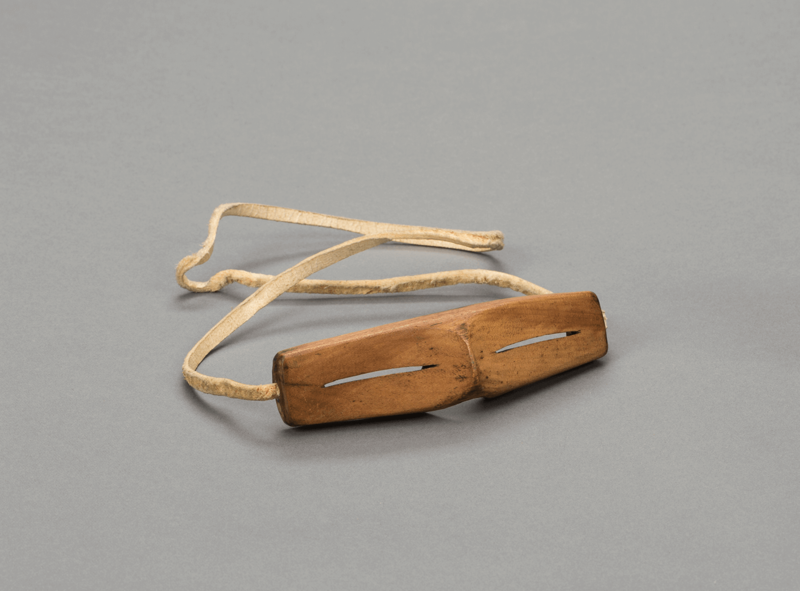 Dorset people are known for their portable art: small animal sculptures, amulets or angakkuq (shaman) ritual objects, such as miniature masks and figurines carved in ivory or driftwood. Around 1150 CE, the Dorset culture died out. Although opinions are divided on the disappearance of this culture, the Dorset people may have vanished after a period of climate warming likely to have disrupted their livelihood. It was around that time when Thule-Inuit migrated from the west to the Eastern Arctic. 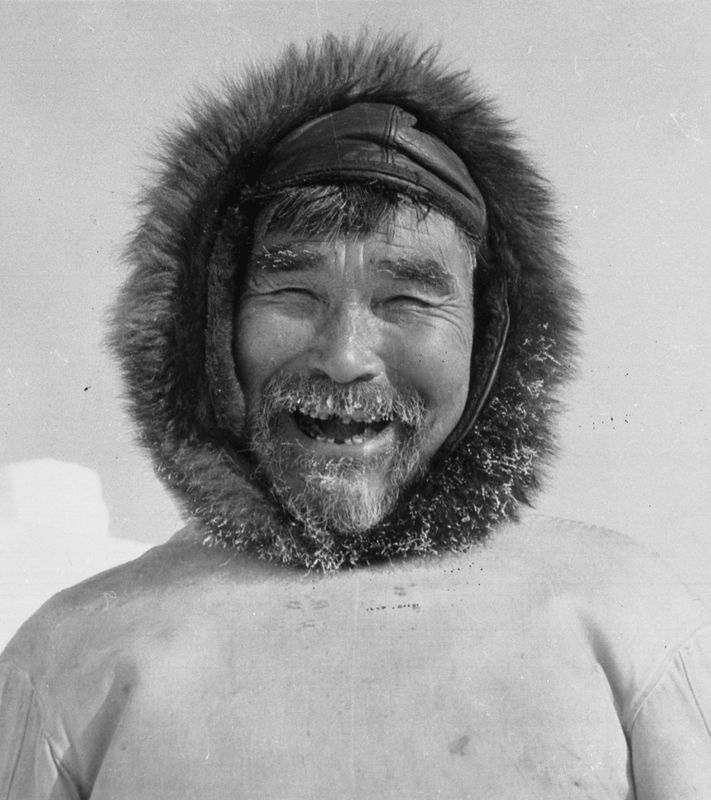 In the oral tradition, the Inuit refer to the Dorset as "Tuniit." The Thule culture developed in northwestern Alaska about 1000 years ago and then spread to the Canadian Arctic. 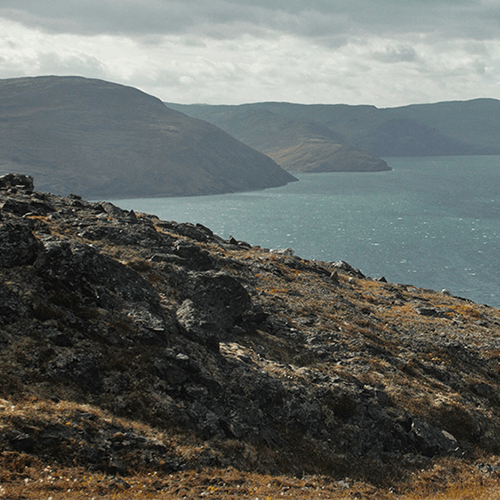 It was during the 13th century of the Common Era that Thule-Inuit groups arrived in Nunavik. They are the direct ancestors of today's Inuit. i. 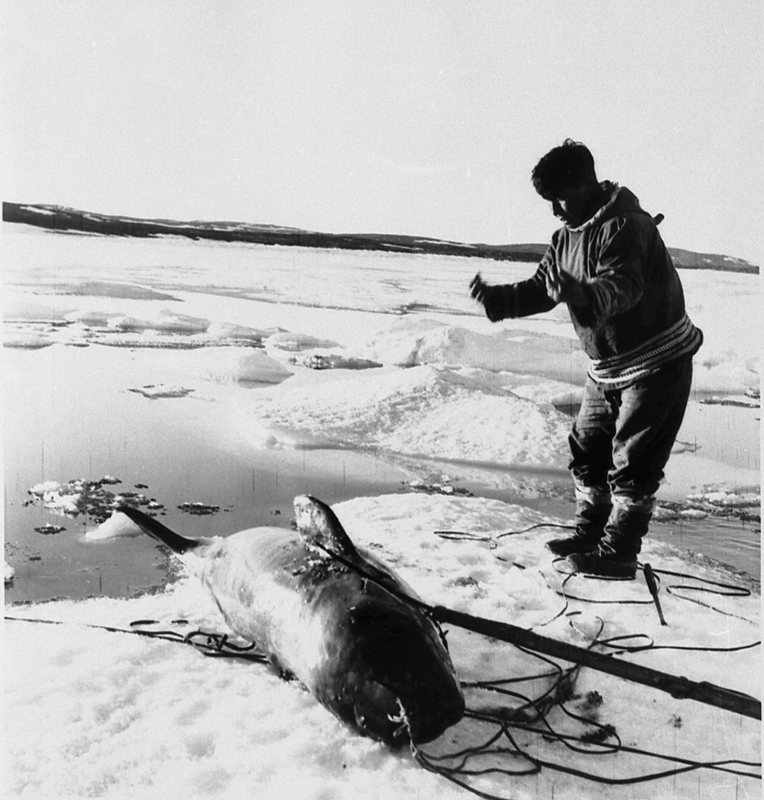 The Thule people were hunters of large marine mammals, such as the bowhead whale. Depending on the availability of resources, they moved constantly across the land by setting up camps for shorter or longer periods. 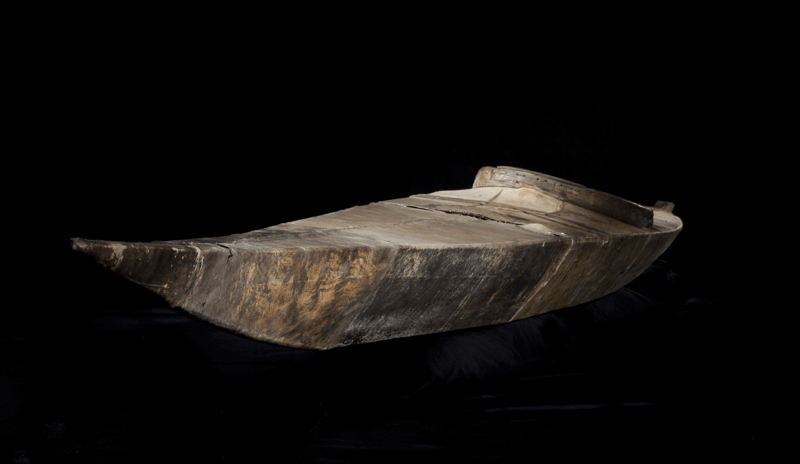 They maintained a high degree of mobility thanks to the kayak, the umiaq (large boat covered with seal skins) and the dogsled. 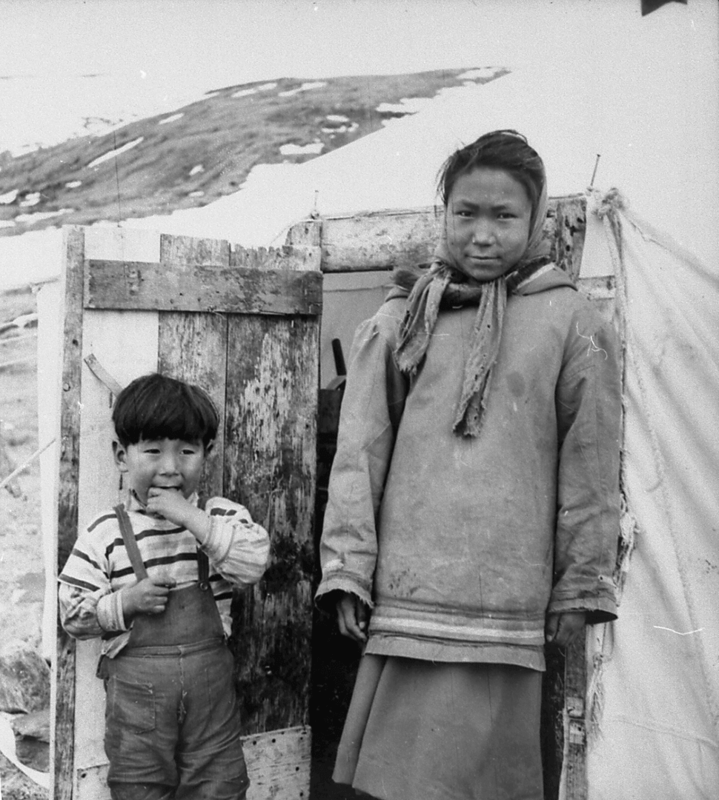 Inuit, who speak the Inuktitut language, were traditionally semi-nomadic hunter-gatherers. 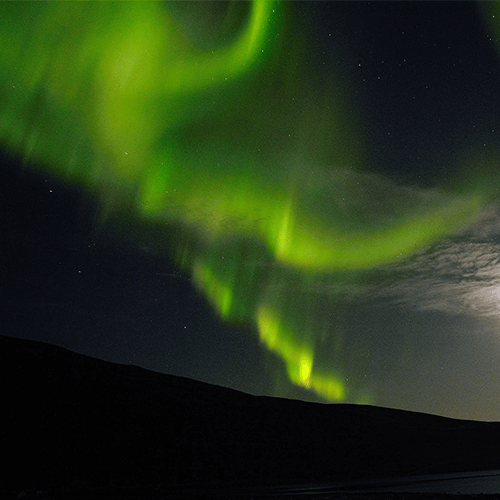 Despite current upheavals due to contact with Euro-Canadians, the Inuit preserve their cultural identity through language, access to their ancestral territories, traditional practices and laws and their art. 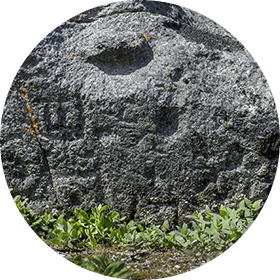 The Qajartalik petroglyphs have not been dated precisely, but they are associated with the Dorset people, especially because the carved images are stylistically similar to their portable art. Thus, these images could be more or less a thousand years old. 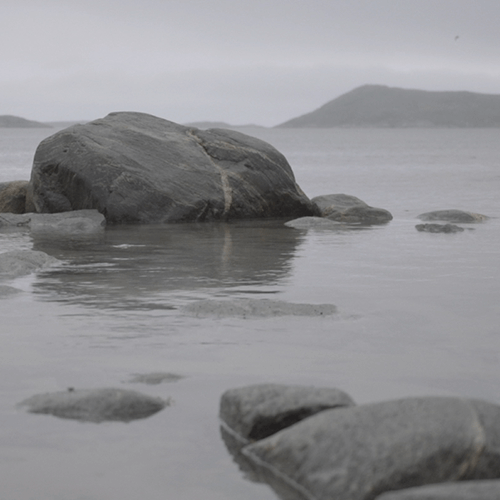 The history of the peoples of Nunavik is transmitted through speech, but also through images. Be it archeological and ethnographic objects, or old photographs, they make it possible to see, and thus better comprehend, the particularities of the various cultural universes that have existed on this vast territory. Let us discover these visual testaments of another time. Cette vidéo présente une entrevue réalisée avec Lukasi Nappaaluk, dans la communauté inuite de Kangiqsujuaq en 2017. Cet ainé décrit le mode de vie traditionnel des Inuits et souligne l'importance de Qajartalik. Il donne également son interprétation du patrimoine rupestre du lieu qu'il associe au chamanisme. 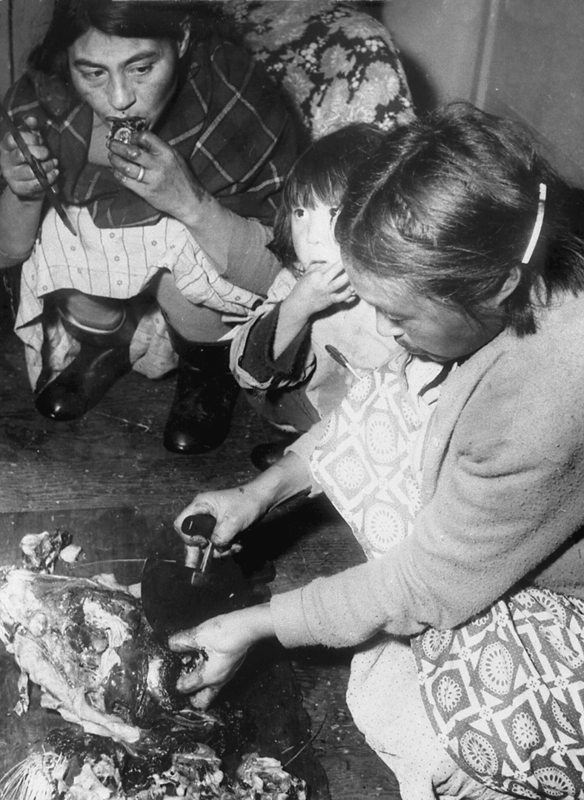 Qajartalik was known to the Inuit, but it was only in the early 1960s that its existence was reported to the scientific community by anthropologist Bernard Saladin d'Anglure. 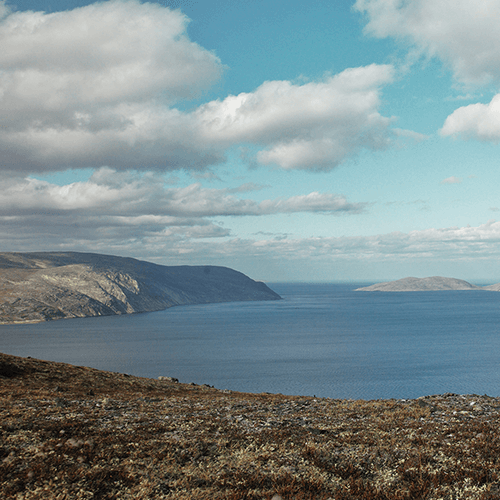 As part of his ethnographic research in the Inuit community of Kangiqsujuaq, he met an Oblate missionary who informed him of the presence of "devils" on Qikertaaluk Island. 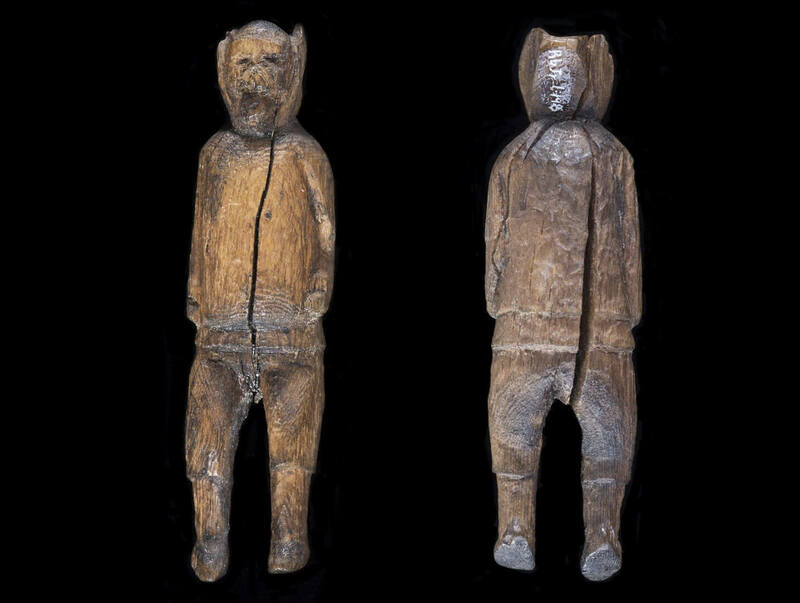 The Inuit people use the expression Tuurngait, or "spirits" evil by nature to designate these carvings. 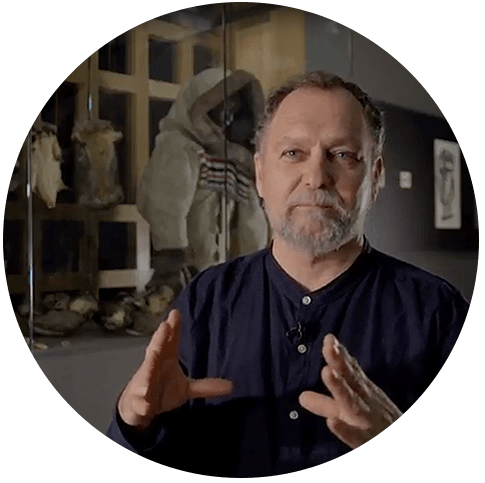 In this video, Louis Gagnon of the Avataq Cultural Institute discusses the scientific community’s discovery of Qajartalik. 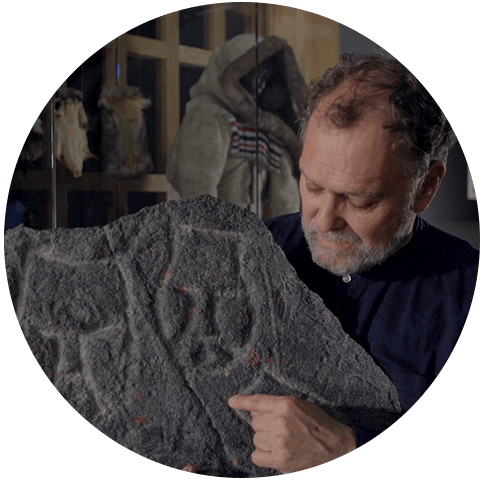 He describes the various research activities carried out over the decades to better understand and protect the rock carvings. 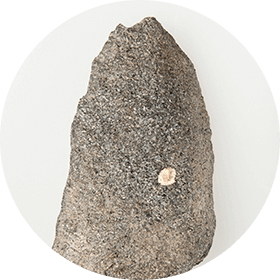 Qajartalik is known not only for its rock carvings, but also for its easy-to-work stone - steatite, or soapstone - which was needed to make oil lamps and containers, and, since the second half of the 20th century, sculptures. Although it is not known when this soapstone quarry was first exploited, its use dates back to the Dorset times, as confirmed by about 150 extraction zones. In a few cases, this type of activity damaged some petroglyphs carved on these steatite rocks. The damage suggests that these petroglyphs were created prior to extraction, but not necessarily all of them. Some 180 carvings of faces were identified at Qajartalik. Always front-facing, they usually measure between 10 cm and 30 cm, although some are approximately 3 cm long and a few are 60 cm in size. The width and depth of the carved lines vary from about 1 cm to a few millimetres. These faces have human features, and sometimes anthropo-zoomorphic traits. Some hybrid images combine human features with elements that look like horns or pointy ears. Some representations were carved with lines on the chin that may evoke tattoos, while others seem to have swollen cheeks and a slightly open mouth, which may represent the act of blowing, singing or speaking. Although some carvings are isolated, most are part of groups of up to ten figures. 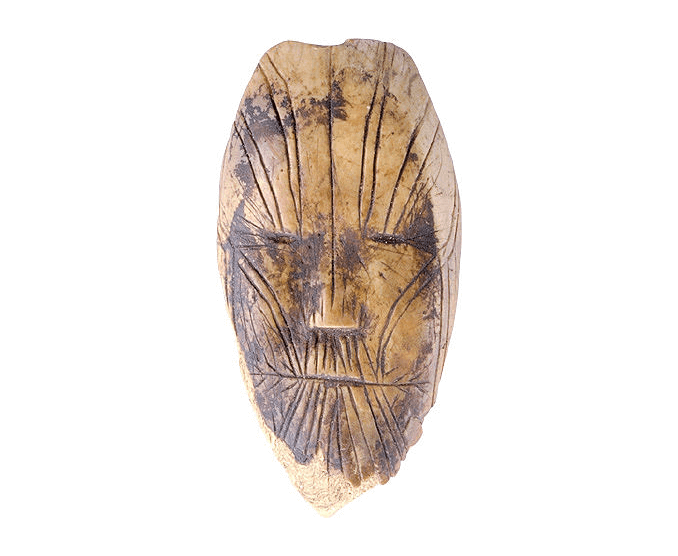 Schematic faces similar to those at Qajartalik were found carved alone or in groups on pieces of caribou antler, walrus ivory or bone, and on rare wooden masks. These were probably used by shamans during rituals. 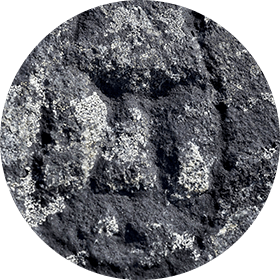 Stylistic comparisons between petroglyphs and portable art objects seem to indicate that these images were carved in the final stages of the Dorset culture. It was a period characterized by great cultural stress. Climate change affected the presence of game, while the Thule settled progressively on the territory of the Dorset people. An increase in shamanic rituals and the production of carvings associated with them may have helped to cope with such changes. The carved faces could also refer to the ancestors or represent the desire to mark the presence of the Dorset people in the landscape. 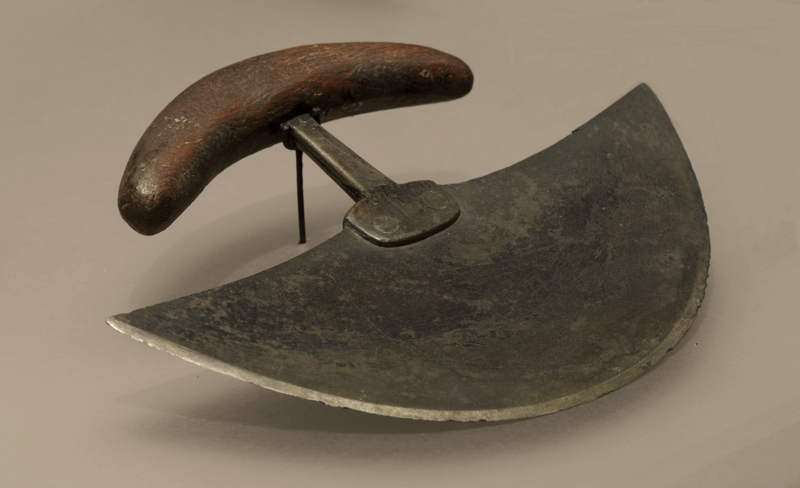 In connection with the extraction of raw material, it could also be a symbolic gesture of barter with the spirits: a carving in exchange for the material useful in the production of a lamp or container. Interpreted especially in a shamanic context, these faces could also represent the different stages of transformation of a human into an animal. Nowadays, the Qajartalik carvings can be mostly seen in oblique light, as shown in the next video. The carved images appear and disappear under the play of light and shadow during the day. Donna Morris, guide mi’gmaque, nous amène sur les rochers de la berge de Kejimkujik, où de nombreux pétroglyphes sont gravés. L’interlocutrice, qui passe d’un motif à l’autre, s’assure de couvrir les gravures avec de l’eau pour en faire ressortir les contrastes. En plus des moments où elle utilise ses mains pour nous illustrer les détails discutés, de gros plans fixes sont faits sur les différents pétroglyphes. 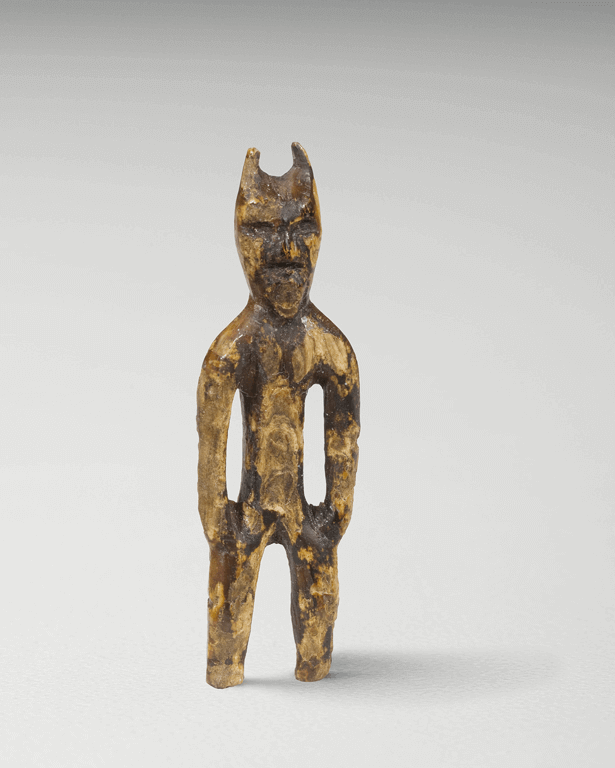 In the early 1960s, anthropologist Bernard Saladin d'Anglure identified 95 figures carved at the Qajartalik site. He made casts of some carvings based on which he determined their Dorset origin. The site was later studied sporadically by archaeologists. 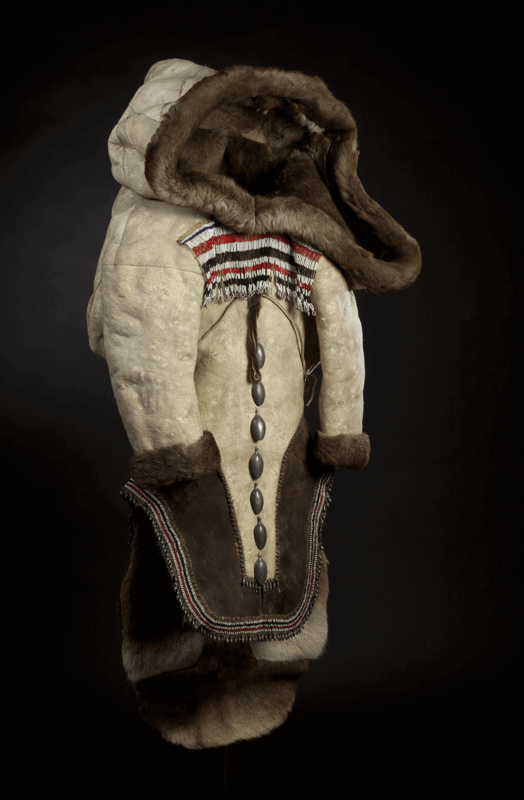 However, it was only in 1996 that the Avataq Cultural Institute, the Inuit organization committed to the preservation and promotion of Nunavik Inuit culture and language, undertook an elaborate inventory of the site and explored the links with Dorset material culture, its portable art and shamanism. 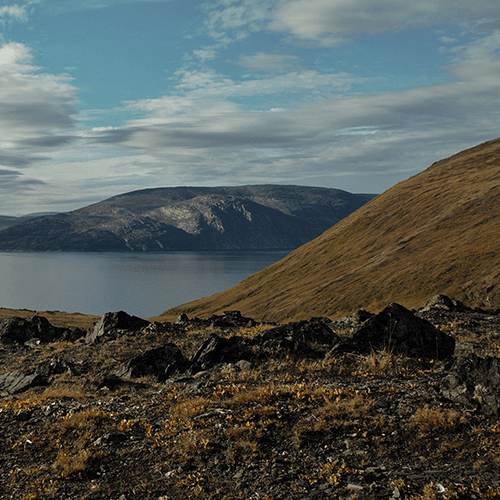 Avataq studied the Qajartalik site at the request of the Inuit community of Kangiqsujuaq and implemented measures for its protection. Recordings and excavations were thus conducted to better understand this unique place. A number of conferences and publications have been dedicated to the site for the benefit of local, regional and scientific communities. The petroglyphs were created by pecking and incision. 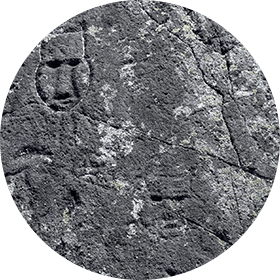 Smaller petroglyphs were made with sharp edge tools, while larger faces were created with a harder hammerstone like basalt or granite. During archaeological excavations, archaeologists have found lithic tools used to create petroglyphs. 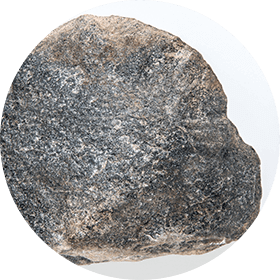 These include basalt hammerstones, which are large rounded pieces of rock, and chisels made of sharp rocks. The Qajartalik site is threatened by natural and anthropogenic factors. These include abrasion caused by the wind lifting sand off the ground, deterioration of the rock due to recurring cycles of freezing and thawing (gelifraction), weathering, desquamation and other effects of atmospheric or climatic deterioration. 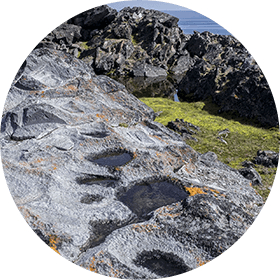 The trampling of carved surfaces, animal droppings, such as caribou and Canada geese excrements and the invasion of rock surfaces by lichens are other threats. However, anthropogenic factors (human origin) like acid rain are the most destructive. For instance, inconspicuous images were trampled due to unauthorized visits by cruise ship passengers despite the remote location of the site. Many of them left with copies of images made with rubbings, undoubtedly without considering the negative impact of their actions on the rock art heritage of the site, which was also defiled by graffiti. In addition, the ongoing search for carving stones by regional artists is a cause of concern for the integrity of the site. Research, education and raising awareness about the importance of preserving this site will hopefully promote its conservation and a better understanding of this place. 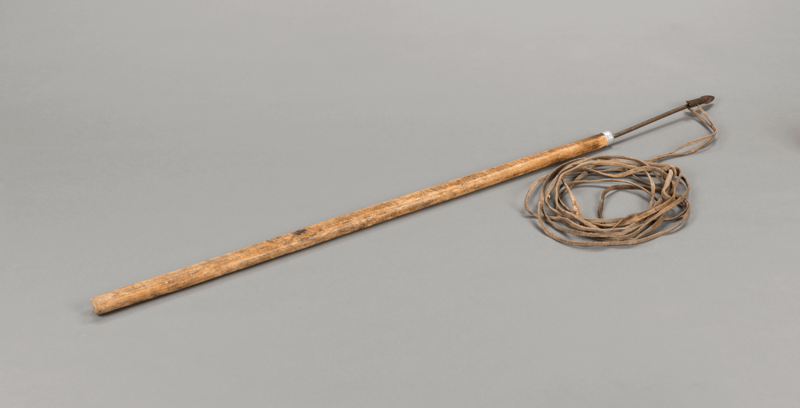 Depuis plusieurs années, à la demande des Inuits du Nunavik, l’Institut culturel Avataq œuvre à la reconnaissance de la valeur patrimoniale unique de Qajartalik. En 2017, ce lieu a été ajouté à la liste des endroits proposés par le Canada comme site du patrimoine mondial de l’UNESCO. L’Organisation des Nations Unies pour l'éducation, la science et la culture est un organisme qui, entre autres, est dédié à la sauvegarde du patrimoine culturel et naturel mondial. En inscrivant Qajartalik sur cette liste indicative, on espère assurer la protection du lieu notamment en adoptant des mesures responsables d’accessibilité du public. Although the Dorset and Inuit belong to distinct eras and cultures, there are many similarities between these peoples. 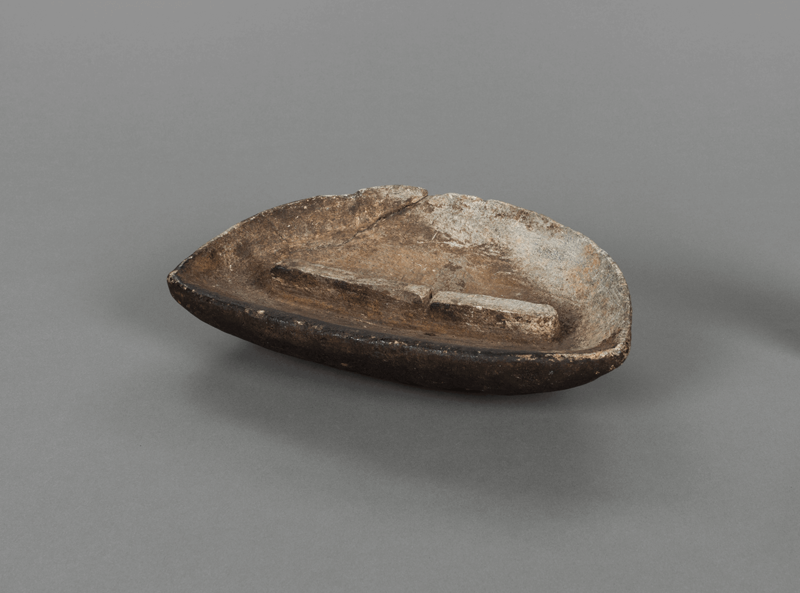 Both occupied the same territory and harvested the same animal and plant resources, but to various degrees; both used steatite to make everyday objects; their craftspeople carved small ivory and bone objects. By observing the Dorset carvings at Qajartalik and comparing them to Inuit contemporary art, another fascinating similarity emerges: the predominant role of the face in both artistic expressions. Could not this exposed body part embodying the centre of emotions be the main symbol of humanity, in contrast to the rest of the body covered in animal skins? From this half-human, half-animal form emerges a human-faced hybrid. 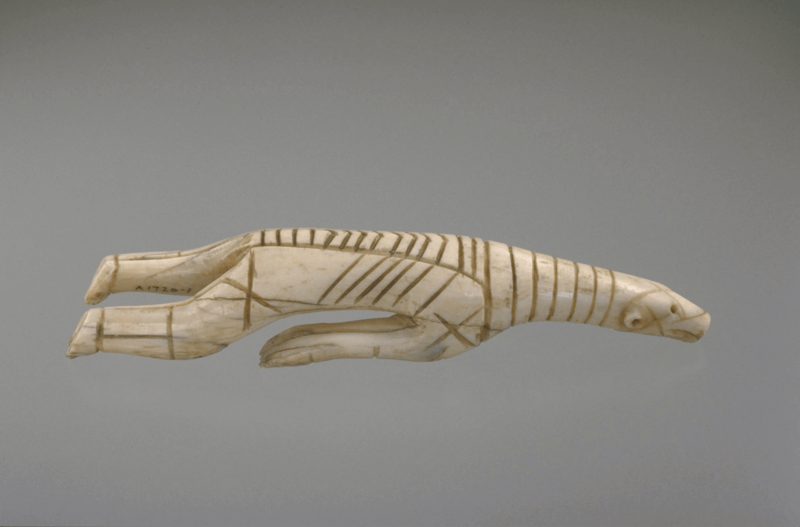 This figure is intriguing, since the Thule people, the direct ancestors of the Inuit, created figurines and other human representations with flat faces yet devoid of anatomical details. My name is Lukasi. 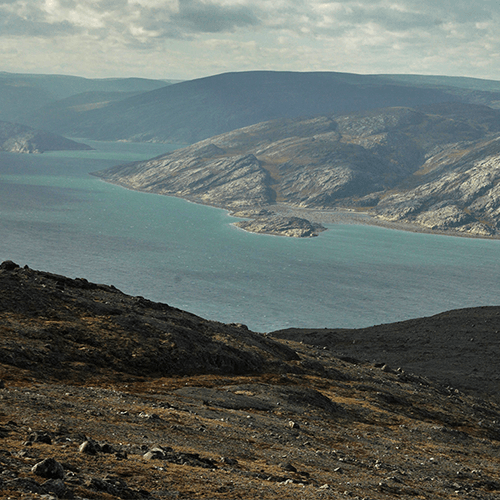 I live in Wakeham Bay [Kangiqsujuaq]. I was born 20 miles away from Wakeham Bay, in the north. 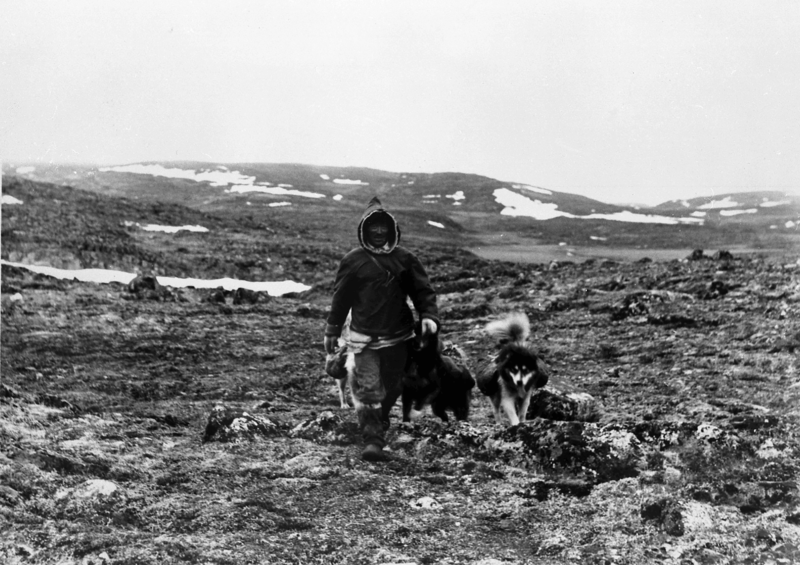 [Series of four historical images: group of Inuit men and women, hunter standing on the ice beside his prey, man walking beside his dog in the tundra, and Lukassi as a child carried on the back of a young woman] Our parents used to go different places, following the weather and following the animals. There was summer, spring, fall and winter, so they have to move every time. So, in July 7, 1949 finally I was born where the hunting area [is]. 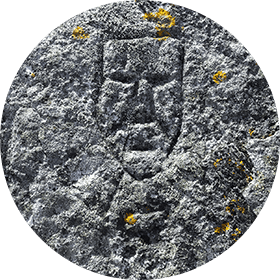 In Qajartalik Island, there is a mask [Static shot of Lukassi] printed in the soapstone. It’s been there, Inuit know it for many, many years. And there was not realise there was important. 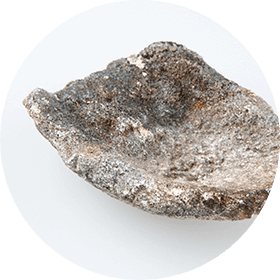 So, when they want some piece of soapstone to make a qulliq [oil lamp] or a pot, so they have to cut a piece of soapstone, where the soapstone is. And probably they make damage to lots of old masks. 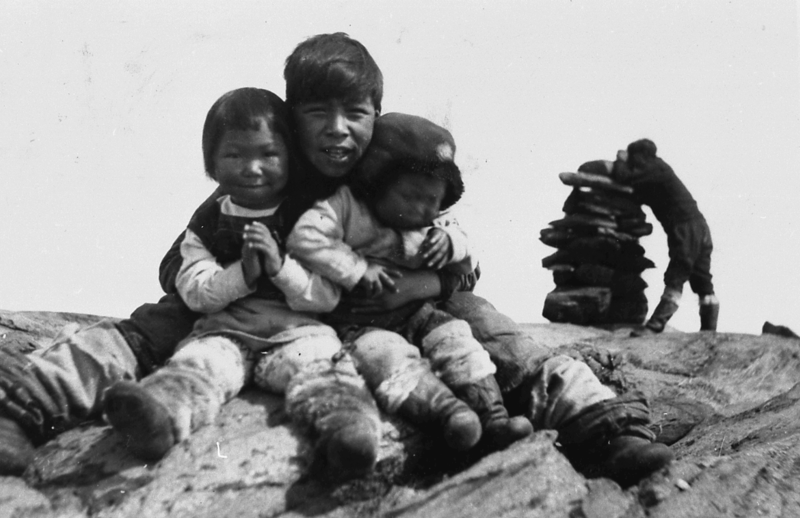 Because we understand that probably is not very important for us, so “Oh, something strange in the soapstone, oh, ok forget about it, it doesn’t really mean.” [Historical image of a group of Inuit posing with a broad smile. They are dressed in traditional clothes] Even our grand, great grand-father or our great grand-mother, they really doesn’t mention about it. So [Static shot of Lukassi. He now uses hand gestures to illustrate his point] even if we see it it’s “Oh, somebody is drawing for fun,” that’s what we thought. I said, “I don’t know, we don’t know.” And, we get a big surprise, we was not realise these masks are important. Before the missionaries arrive, there was a lot of shaman. And the shaman used to ask for extra help from his power, where he gets his power from because he is a shaman. He wanted to help more people. The shaman was not a danger in the old days. When somebody is sick, they was like a doctor make a sick person well again. Or even somebody died, and asked to know something, when the shaman is available, if he had enough power, he can make the people back to normal again. That’s what they did before. Probably take print in the soapstone asking for more, more power. That’s what we thought. My name is Louis Gagnon. I am responsible for the Museology and, Arts Secretariat Departments at the Avataq Cultural Institute. It is an Inuit organization. It was created in 1980, at the request of Elders of Nunavik. 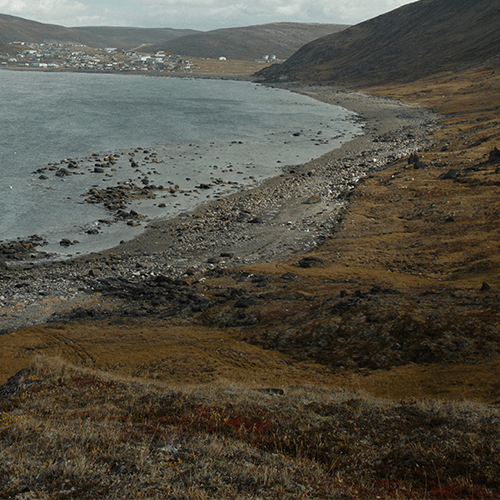 Anthropologist Bernard Saladin d'Anglure [Photograph of Mr. Saladin d'Anglure] was in the village of Kangiqsujuaq, [Aerial shot of the Kangiqsujuaq village] also called Wakeham Bay, or Maricourt, even at that time. Bernard heard from the Oblate, an Oblate missionary who was in the village heard of an island [Still image showing in foreground 2 engravings of faces and the surrounding seascape of Qajartalik] inhabited by devils. Obviously, [Still close-up image of two carved faces] it piqued the anthropologist’s curiosity. He absolutely wanted to go to this island where there were devils. That was Father Mascaret. 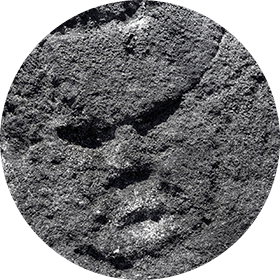 [Still close-up image of another carved face] This occurred in 1960-61. So Bernard went on his first expedition. [Static shot of Louis Gagnon] If memory serves me right, Jugini Irniq accompanied him as his guide. So he went to the island, discovered these engraved faces, [Still image of a group of carved faces] and started a first inventory. He brought back information from his work, and he, but this is really an important contribution, he published a short paper, [Static shot of Louis Gagnon] it seems to me, in January 1961, where he talks about the discovery, or the rediscovery; let’s say, of the discovery. He is the discoverer of the site for the scientific community. But, the Inuit knew that the site existed. That has to be understood. So his curiosity led him to discover the site, and he tried to identify it. He defined it as best he could in the time that he had. He may not have been there at the best time of the year. He even had to move quickly. So, that's it. It was an adventure that started abruptly. He went back there to record the images. He made latex casts of some of the faces. [Still close-up image of a carved face] These masks were carved fairly on human scale. So, we can see roughly the proportions. 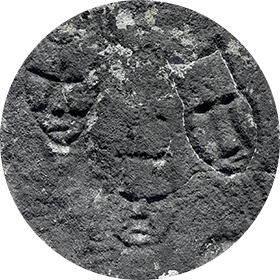 [Still close-up image of a group of three carved faces] So, he looked for ways to record as much data as possible. He is the scientist who laid the foundation [Static shot of Louis Gagnon] for a research process. After that, the site was somewhat forgotten. There is a rediscovery, of this site, I would say, that occurred it seems to me, in the eighties, when a researcher, a young researcher made it his thesis project. Without going to Qajartalik, he analyzed a number of motifs. 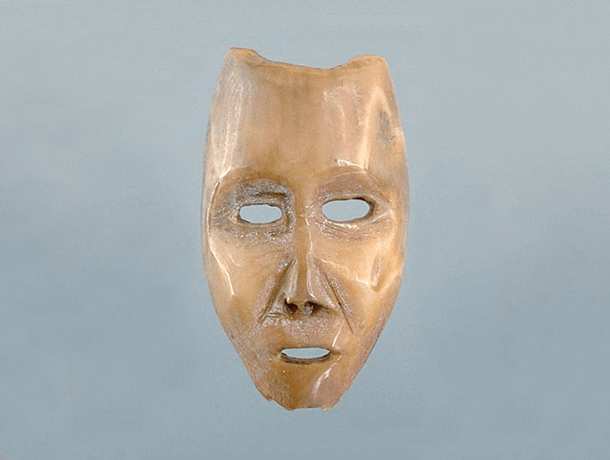 [Series of still images showing a Dorset wooden mask, a smaller mask carved in ivory, an image of Louis Gagnon during work at the site, finally a group of carved faces] He established connections with Dorset art, in fact with Dorset representations. So there were several steps, and it is only in 1995-96 that we well, in fact, Daniel Arsenault and I that we managed to convince Avataq to see that it would be interesting and relevant. And it actually coincided with an interest in the village for a thorough study of the site. [Static shot of Louis Gagnon] So, in the mid-nineties, Daniel and I, along with Daniel Gendron, who is Head of the Archaeology Department at Avataq, we organised a first mission that we carried out in 1996. In fact, to be able to talk about the carvings, I think that this gives a good example, because we are not currently on the Qajartalik site. It may be interesting to note that there are actually several of what some might call styles, wich is in fact types of representation. But there is a basic element that, I would say, persists or, in fact, that is persistent. We have a high forehead with a more or less pointed shape at either end, both framing the forehead. Among the recurrent elements present on just about any motif, you have this line that crosses, a curved oblique, a line in a curve, in fact, a horizontal transverse line, which is always extended by two downward-pointing lines. They are vertical and slightly spread out to outline the shape of the nose, a nose which widens at the base. And then, there is here a more or less oval or rounded shape that surrounds the bottom of the mouth. And very, very often, but not always, but almost always, a small groove indicates the mouth. So there are the eyes, and the shape of the nose, which shows the bridge of the nose because it is hollow. Basically, the lines reach the bottom of the face on each side to define the mouth, a protruding mouth. This motif has a projection effect. Because, without these lines, the cheekbones would be less outlined, the cheeks would be less prominent. Here, they are emphasized. And it's recurrent. They are on all the motifs. So there is a design, there is a way to represent the face. And there’s another feature; let’s focus on the categories: motifs may be more or less emphasized. Curves may be created; here it is quite pronounced. Then it goes up with much more emphasized pointy shapes on each end of the forehead, actually, the frontal part of the face. 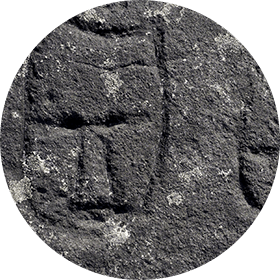 [Still image of two faces carved at Qajartalik] And we can also see that the forehead is very high. Is this hair, or a particular haircut? Perhaps. Some even see it as a devil's horns. [Static shot of Louis Gagnon] Perhaps it is an interpretation that is influenced by some religious beliefs, I would say. And eventually, we interpreted that there were parallels with clothes from the Dorset culture. As we see it, several elements lead us to believe that these carvings date back to the end of the period when the Dorset occupied this territory. It was a time of great stress for this group of people, and that could explain the signs of more intense magical-spiritual activity. Among the elements that led us to first interpret these pointed shapes, we drew a parallel with the garment extended at the back with a high collar that came forward. There were no hoods in the Dorset representations. The Dorset people carved representations of human figures; here we can see a large hood that goes around and that ends into a tip there. And we can presume that these pointed shapes are represented here by this curve, depending on the angle from which we are looking, if we look at the figure like that, we can see this curve with a pointed shape on each side that basically represents the hood. This is as if the carver had the idea of the shape of the head, the top of the head that shows the hood, not the hood, the collar, the large collar. This could explain this recurrent shape. Perhaps there is also a question of connection, an anthropomorphic figure that also combines a zoomorphic feature, that is, the ears of an animal. Many animals are known for having ears that point outward, but really pointy ears, like a wolf’s. We could have all the canids that are very close to the Inuit, the fox and all that. It could also provide some potential interpretation. But obviously, this is a recurrent theme. Another thing, you see, is that the dimensions are often close to full-scale. However, smaller representations can be seen, but also even smaller ones. I would say that, in terms of proportions, it could cover the maximum size of the nose that we have here. So, the figures can be relatively small. And the technique could change. Here, we see that the groove might have been scratched deeply. But for the smallest motifs that I could see, in fact, that we could find at the site, we could see that it was much more incised. It is as if a cutting tool as used to only outline the motif.